In the winter of 1282, snow and ice ravage Tyndal Priory in East Anglia while Prioress Eleanor worries whether her maid, Gracia, will choose to live in the world or remain in the priory and take vows. But a far greater problem arrives at the priory gate. A group of seven abbots with their servants, on a journey to Norwich to visit a papal envoy, seeks shelter. One has fallen mortally ill and soon dies of an unknown ailment. One by one, others in the party fall victim to misadventure or death while Sister Anne struggles to discover the causes. Who is behind these attacks and why? One suspect is Odo, the ambitious Abbot of Caldwell and brother of Crowner Ralf. Or is he simply a red herring? The crowner may not love his brother, but he does love justice, and Prioress Eleanor is determined to stop the carnage that has shattered the tranquility in her priory. Once again, she and Brother Thomas must struggle to restore peace and justice to one small part of a troubled world. "Her clever integration of an Agatha Christie-like plot into her chosen period will please whodunit fans." "Royal's 13th medieval murder (Land of Shadows, 2016, etc.) takes a page from The Mousetrap, forcing the detective to think outside the box imprisoning her and her suspects." "Why do I love Priscilla Royal’s mysteries? Let me count the ways. She brilliantly recreates the medieval world, offering us an opportunity to time-travel in each novel. Her details of daily life are vividly described and well researched. She has created a familiar, fictional community, inhabited by characters we care about: the Prioress Eleanor, proud, pious, and determined to do what is right for the nuns and monks under her rule at a time when women were not expected to wield power. Brother Thomas, honorable and courageous, his compassion for others honed by his own suffering. Sister Anne, a skilled healer who has had more than her share of sorrows. The crowner, Ralf, whose service for the king has given him a jaundiced view of mankind. Eleanor’s brother, Baron Hugh Wyndthorpe, who has returned to England haunted by his crusading experiences in the blood-soaked Holy Land. Gracia, the young girl who found refuge at Tyndal Priory after being orphaned and abused. We enjoy spending time with these medieval men and women, so each new mystery offers a homecoming of sorts. And of course evil then intrudes into the precarious peace of village and priory life. 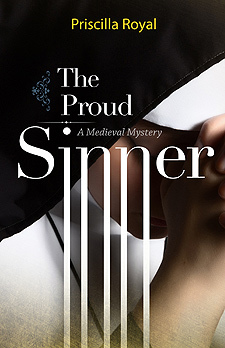 In The Proud Sinner, her thirteenth book, Prioress Eleanor, Brother Thomas, and Crowner Ralf face one of their greatest challenges when a blizzard strands a party of abbots on their way to meet a papal legate. Pompous and quarrelsome, they are not easy guests. But worse is to come, much worse. They are being stalked by a madman and the suspense mounts as the storm intensifies and, cut off from the world, they begin to die. As usual, Priscilla Royal spins an ominous web of intrigue and mistrust that makes for compulsive reading."